Our On-line Store allows you to order products using your credit card. Not all products appear in this store. If you don't see what you want, give us a call and we will process your order by phone. This is the original 1906 El Camino Real Bell as used by Caltrans and seen in front of each mission and along Highway 101 from Mission Sonoma to the Tia Juana Meixico Border. This is the original 1906 El Camino Real Bell as used by Caltrans and seen in front of each mission and along Highway 101. Bell alone, no piping. Bronze Bell Shown. This incredible bell will be a beautiful addition to your mission style home. The bell is 21" tall and 20" in diameter. It is be available in patina bronze, and dark patina bronze. Clapper is included. "Mission San Diego De Alcala 1769" 13" tall by 15" wide 95 lbs. in bronze and 25 lbs. in aluminum. Bronze bell patina finishes available are verde green patina with charcoal highlights. Aluminum bells are available in powder coated Copper/Brown, Verde Green, Light Bronze, or unpainted. 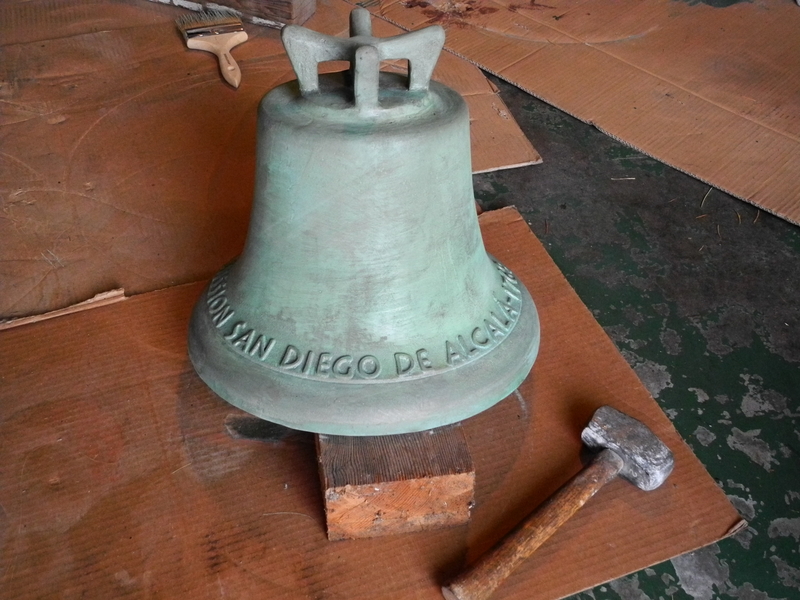 This beautiful patina bronze bell will add audio to your hacienda. UPGRADED Clapper included. Optional hand forged bracket. Made in California by Californians. This beautiful 8.25" diameter patina bronze California Mission bell is a large bell that can be hung from a patio post or wall. Clapper included. 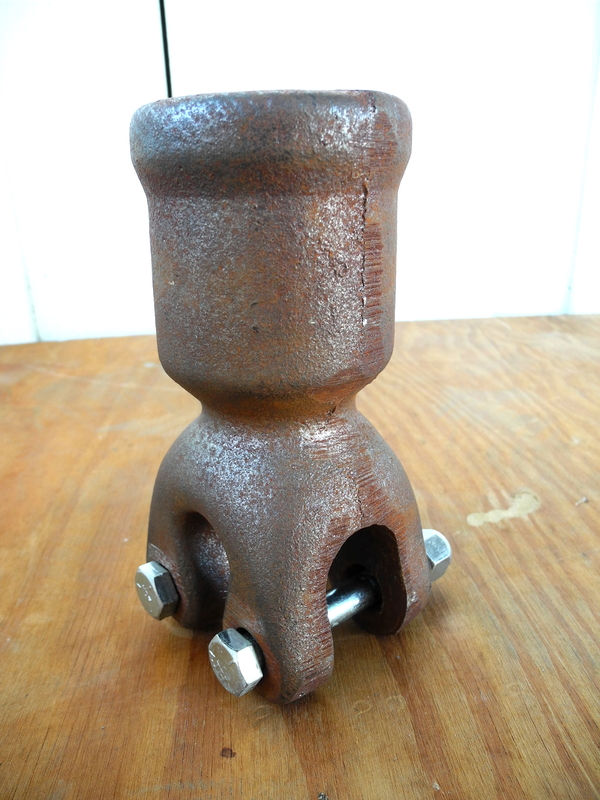 Optional hand forged iron bracket. 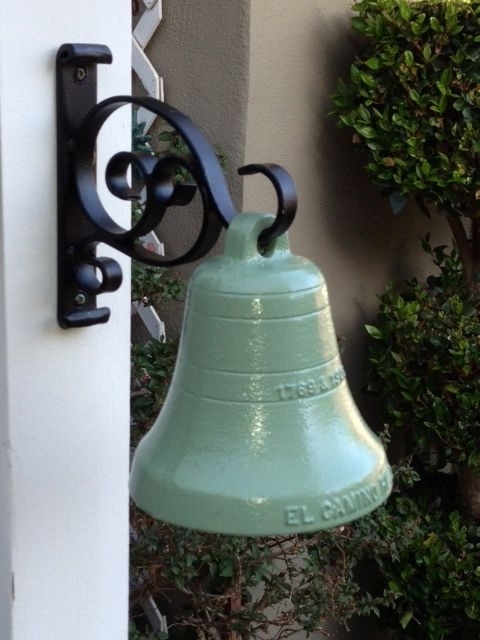 El Camino Real 5" Bell with clapper and painted wrought iron scroll bracket. Made in California by Californians. 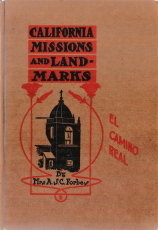 PDF ON CD ONLY "California Missions and Landmarks", 1925 by Mrs A.S.C. Forbes., The creator of the EL Camino Real Bells wonderfully describes the California Missions and other historical landmarks. 394 pages. Text, drawings, and photos. 2nd Edition "Guide to the Historic Bells of Mrs. A.S.C. Forbes" by Max Kurillo and Erline Tuttle in 2003. The original hard copy 237 page book is now out of print. Revised and expanded in 2011 and available. Text and Photos. This is the clapper that comes with the larger bells we sell on down to the Jesus Maria 1690, but it's also available to you for any medium to large bell that is missing a clapper.